A conceptual rendering of the engineering building expansion—the additional spaces will create a learning and discovery continuum that promotes innovation and creativity, offering an integrated approach to education and research. New facilities to support the College of Engineering and Applied Science will create the infrastructure for excellence in education, research and service. A new era is dawning for the University of Wyoming College of Engineering and Applied Science (CEAS)—an age that will elevate the college to new heights of excellence in education, research and service. Guided by the Wyoming Governor’s Energy, Engineering, STEM Integration Task Force and CEAS leadership, the Tier-1 Engineering Initiative was born. (STEM stands for science, technology, engineering and mathematics.) A complex of facilities—which includes the Michael B. Enzi STEM Facility, the Energy Innovation Center, the future High Bay Research Facility planned for the east campus, and a new Engineering Building north of Lewis Street—will provide the necessary infrastructure for growth. “I think the whole idea behind the Tier-1 dream for engineering is really creating a program, facilities and environment that turns out world-class undergraduate engineers, that has top-tier graduate programs, that has research that matters to the state of Wyoming and to global industry, and that has a fantastic K–14 pipeline of future scientists and engineers across the state,” says Thomas Botts, co-chair of the task force and a CEAS graduate. The retired executive vice president of global manufacturing for Royal Dutch Shell, Botts is a board director for EnPro Industries Inc. and Wood Group. State Sen. Phil Nicholas, also a member of the task force, played an integral role in getting the initiative off the ground. As the father of four UW engineering graduates and a senator with many constituents in the college, he knew the Engineering Building needed upgrading and expanding. He also knew that a strong engineering program is good for Wyoming’s economy. “We always hear from our constituents that the No. 1 priority is jobs, the economy and economic diversification,” he says. Many new Wyoming businesses are university spinoffs. “If we can generate more industry out of the university, we can improve our economic development and our diversification. We’ve got to have a strong engineering program in order to do that.” He adds that the state also needs more engineers. With tremendous support from Nicholas, the Legislature approved funding for the new Engineering Building, which has become a primary driving force for the Tier-1 Engineering Initiative, inspired by the success of UW’s School of Energy Resources (SER). “All of it came together and created a Tier-1 effort looking at how we take CEAS and develop niches of excellence that will rise the tide for all the departments and all the faculty,” Nicholas says. “A large part of the state’s economy is built on energy, so having the university be an engine leading the way on energy education and research will help us maximize the value of the tremendous natural resources we have in this state. But the Tier-1 effort is not just about energy—it’s about the whole college,” Botts says. “CEAS graduates will be well prepared for the work-force,” says CEAS Interim Dean Al Rodi. “Having experience with modern techniques and faculty who are working on current problems is really the name of the game. There’s a definite relationship between quality instruction and research activity.” The Tier-1 Engineering Initiative is underpinned by four strategic pillars: excellence in undergraduate education, world-class research and graduate education, productive economic development through partnerships, and K–14 STEM education, all of which you can learn more about in this issue of UWyo Magazine. “We have the opportunity and resources to help us achieve these goals—support that is unprecedented on a national level,” Rodi says. In order to achieve this growth, UW needs additional labs, research spaces and classrooms: Enter the High Bay Research Facility, Engineering Building expansion, and the new Michael B. Enzi STEM Facility. 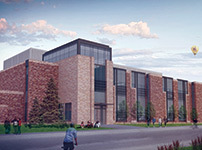 Built in partnership with SER, CEAS and the Department of Geology and Geophysics, the High Bay Research Facility will be located on north 19th Street near the UW Centennial Complex, with completion anticipated in 2016. It will contain approximately 90,000 square feet of traditional and high-bay research laboratories, offices and meeting areas. From a funding standpoint, what makes the facility unique is the public-private investment. “Our partners are private-sector partners that want that research done, including research into flow through porous media, improved oil recovery and geomechanics,” Northam says. “The work that’s going to come out of the new research facilities and the whole program is going to make a huge difference in the nation’s energy security,” Botts adds. A new building will be added north of Lewis Street behind the present CEAS buildings. 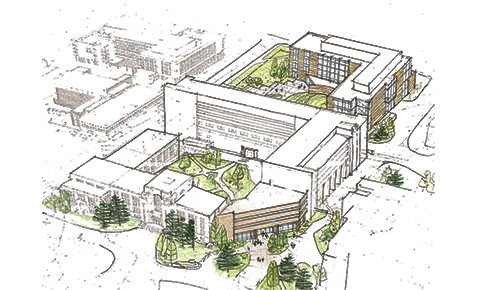 The $106 million project is the largest single capital project in UW history. The majority will come from state appropriations, with additional funds raised from private donations. The building will include an auditorium and flexible spaces to accommodate future growth. “Some of our labs on campus are running up to 12 hours a day,” says Bryan Shader, professor of mathematics and a member of the Enzi STEM Facility planning committee. One room of the facility is devoted to training elementary math teachers, complete with the math learning tools that teachers will later use in their own classrooms. Science will be on display throughout the facility, with interactive displays and science-themed artwork. Glass walls wherever possible also place science on display, and group rooms encourage student collaboration. The public will be welcome in the Enzi STEM Facility, including school field trips, speakers and events. Ready for classes in fall of 2015, the 100,000-square-foot facility is home to 32 laboratories geared toward basic science and math courses. “Every student who comes through the Laramie campus is going to go through the STEM building, and every student should leave that with a positive experience,” Shader says. Each of these new buildings adds an important foundation upon which the Tier-1 initiative can grow, propelling UW to new heights in excellence in education, research and service. The University of Wyoming has a proven track record of working with the energy industry to deliver successful solutions to today’s challenges. These partnerships have played a strategic role in funding the High Bay Research Facility, and UW extends its utmost gratitude for these partnerships. Read more about the partnerships that have played a strategic role in funding the High Bay Research Facility.